Peter Bevan-Baker (Green Party of PEI), Joe Byrne (New Democratic Party of PEI), Dennis King (Progressive Conservative Party of PEI) and Wade MacLauchlan (Liberal Party of PEI) will take part in a forum on environmental issues on Monday, April 8th. The forum will be moderated by Dr Carolyn Peach-Brown, Chair of Environmental Studies at UPEI. The Coalition for the Protection of PEI Water is one of twenty groups that have collaborated to organize this forum. Groups were asked to submit questions on a wide range of topics, and these will be addressed by each of the leaders. In addition there will be time for questions from the audience. This is an important forum, a chance to hear how each party proposes to address ongoing threats to our water, oceans, lands and forests and the urgency of climate change. Monday, April 8th, 7-9 pm, in the Alex H. MacKinnon Auditorium, Room 242 of McDougall Hall on the UPEI campus. You are invited to a general meeting of the Coalition for Protection of PEI Water on Monday, January 7th, 7:00 pm at the PEI Farm Centre. A few members of the Coalition will meet with Minister of Environment, Richard Brown on January 3rd – a lot of time has elapsed since we’ve heard anything about the Water Act and its regulations, so we’re hoping to be able to provide some kind of update on the 7th. There will also be time to share ideas/concerns about issues that we might want to take action on, and to talk about organizing for the next election. But this is simply not the case. Everyone does not have ready access to a place at Minister Brown’s table. I am a member of three organizations that have ‘the interest of the environment first.’ Each has had considerable difficulty arranging a meeting with Minister Brown. The Coalition for the Protection of P.E.I. Water formed in 2013 in response to the Cavendish Farms proposal for lifting the moratorium on high capacity wells for agriculture. Its membership includes 20 environmental, watershed and social justice groups and more than 200 individuals. The coalition has been actively involved in the ongoing process of development of the Water Act. The previous minister, Robert Mitchell noted in the legislature the important contribution the Coalition had made to the Water Act. The Coalition made several requests for meetings with Minister Brown since he was appointed in January. Eventually a meeting was arranged and then cancelled by the minister. He said he would reschedule. We contacted him again at the end of May. We’re still awaiting his call. The Environmental Coalition of P.E.I. has a long history of working on behalf of the environment. For 30 years, ECOPEI has been a leader in environmental education, done pioneering work in the restoration of the Acadian Forest through the MacPhail Woods Ecological Forestry Project, and done extensive tree planting across the Island, and organizing electoral forums on environmental issues. ECOPEI has made several requests for meetings with the minister since January to discuss our concerns about a range of important environmental issues. He called back in June, talked about setting up a meeting. We’re still waiting for his call. The Citizens’ Alliance (CA) formed out of the response of a large group of concerned Islanders to the Plan B project. And while the battle to stop Plan B was unsuccessful, CA formed to continue the spirit and energy of this group. Its mission is to be a vigilant observer and advocate for the environment and to promote democratic process. CA was instrumental in the initial organization of the Water Coalition, in bringing the Blue Dot/Environmental rights campaign to P.E.I., and in opposing the plan to bottle P.E.I. water for export. CA’s request for a meeting with Minister Brown also went unanswered. Why such a different response? Do the citizens of Prince Edward Island really feel that industry deserves meetings and access while the public does not? Do Islanders believe that the health of the environment that sustains all of us should always take a back seat to the promotion of unlimited economic growth? Do citizens believe that those interests with money and power are entitled to more of a say about what happens on P.E.I. than the rest of us? – Don Mazer is a member of the Coalition for the Protection of P.E.I. Water, ECOPEI and the Citizens’ Alliance. He lives in Suffolk on the Winter River. Sacred Water: Standing Rock is the first in an 8-part documentary series that showcases Indigenous activists across the Americas rising up to protect their ancestral homelands and the environment. There will be a public screening of the documentary on Monday, April 23 on the UPEI campus (7:00 pm) in honour of Earth Day 2018. The people of the Standing Rock Sioux Reservation of North and South Dakota are fighting to stop the Dakota Access Pipeline from being built on their ancestral homeland. The pipeline would snake its way across four states, bisecting sacred Indigenous sites and burial grounds along the route. The 45-minute film was shot towards the beginning of the Standing Rock protests in 2016, and ends just as new protestors and allies join them, responding to desperate social media calls for support. It is a moving examination of a protest movement on the brink of gaining international attention. 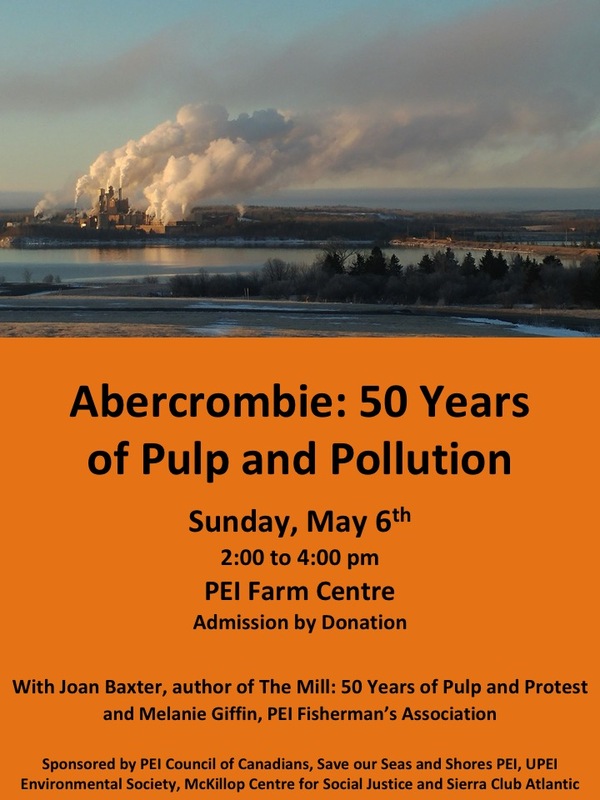 Award-winning journalist and author, Joan Baxter will be in PEI to talk about and read from her book, “The Mill: Fifty Years of Pulp and Protest”, on Sunday, May 6th. Since 1967 the Abercombie mill, under various owners, has used the tidal estuary at Boat Harbour as a waste lagoon. Boat Harbour (A’Se’K), is traditional Mi’kmaq territory, of great importance to the Pictou Landing First Nation. It was historically used as a harbour and was rich in eels, lobster and other shellfish. As a result of the continuous dumping of wastewater, today it is a toxic soup containing some of the world’s most dangerous chemicals. In 2015 the Nova Scotia Government passed the Boat Harbour Act, which requires the Abercrombie mill to have a new treatment facility in operation by 2020 and which mandates the clean-up of the Boat Harbour lagoon. Late in 2017, Northern Pulp, current owners of the mill, made public its proposal for a new effluent treatment plant. The new system would see up to 90 million litres of litres treated wastewater discharged into the Strait each day. The mill is situated directly across the Northumberland Strait from Prince Edward Island. Local fishermen have expressed concern about the potential impact of such a large amount of fresh (and warmer) water being discharged into the Strait, which is prime lobster fishing ground. Melanie Giffin, a marine biologist and program planner with the Prince Edward Island Fishermen’s Association, says even if the effluent is as clean as possible, the sheer amount of fresh water being introduced into the Strait could have a detrimental affect on multiple species. “As we know, fresh water floats and so does all of our larvae, more specifically lobster larvae,” she says. Giffin will also be present at the event to offer some local perspective on the Northern Pulp waste treatment plan. The event will take place on Sunday, May 6th at 2:00 pm at the PEI Farm Centre on University Avenue in Charlottetown. It is being hosted by the PEI Chapter of the Council of Canadians, Save our Seas and Shores PEI, Sierra Club – Atlantic Canada Chapter and the McKillop Centre for Social Justice. The Coalition for the Protection of PEI Water recently met to discuss the newest draft of the Water Act. After an inclusive and thorough participatory process, we are disappointed that no public consultation was allowed for this final draft.